One of my main goals as a blogger is to help others think outside of the box and be more creative. As long as I can remember, I have always tried to repurpose things or make do with what I had. So when I was asked the other day what supplies I would suggest to have on hand, my first thought was to just look around. I hate to spend a bunch of money on supplies when kids art really is mostly about the process, not the product. Where should you start with art and craft supplies? Building up your supplies does not have to be expensive. You can even find cute aprons that can be used for paint smocks if you don't have an old t-shirt for the job already. But beware, just because you're at the dollar store does not mean you cannot overspend. 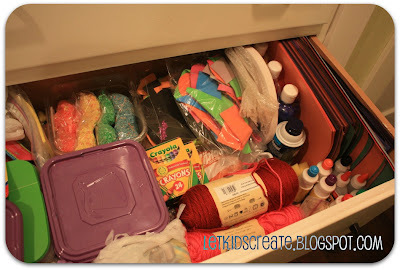 Here's a peak into one of my craft supply drawers (I should have organized it a bit before I took this shot, but you get the idea). magnets from all those phone books that get delivered to my doorstep, etc. I am starting to look like a hoarder, but here's a little peak at my "trash supply". Honestly, the possibilities are endless if you have scissors, glue, paint and garbage. Buy glue, crayons, markers and paint in bulk when they go on sale for back to school. These basic supplies can be used in so many different ways. My favorite paint to use is Crayola Washable Kids Paint because it really is washable (unlike some of the other washable paints I have tried). Turn to your pantry: you can dye rice, pasta and salt to a rainbow of colors with a little food coloring and vinegar or rubbing alcohol. Glue can also be dyed with food coloring and used as paint. You can even make homemade paints using flour or cornstarch. Use objects other than a paint brush to paint. I have seen toys (cars, marbles, Legos, balls), forks, food, old credit cards, toilet brushes (I'd go with new ones from the dollar store here), cookie cutters, scrub brushes, straws, etc. What other tips and ideas can you share to build up your craft supply without breaking the bank? A great post! I feel the same way. There's so much you can do with recycled materials and things at your local dollar store. It really doesn't take much money to come up with creative opportunities. 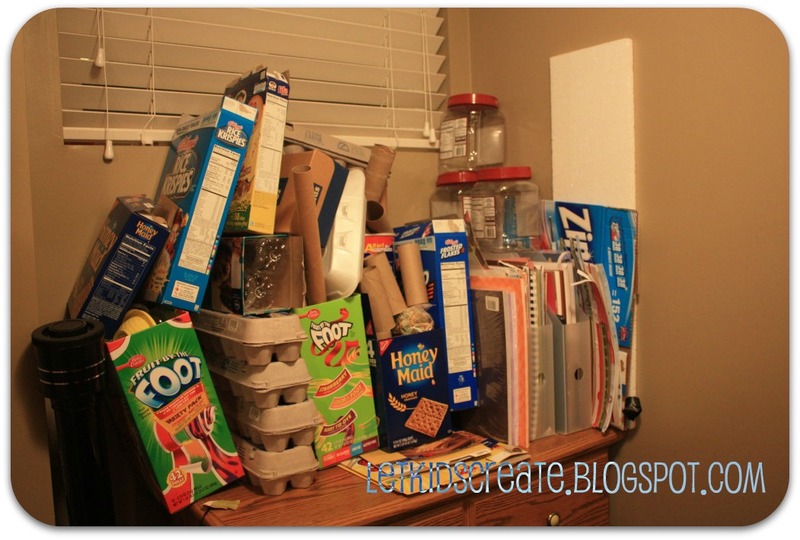 I definitely agree with repurposing your trash as art supplies. My problem is that our tiny storage space for all that stuff is making me look like such a hoarder! 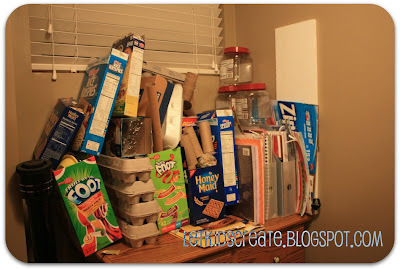 When I went on my trip, Hubby threw out all the bottlecaps I had been saving for a craft with the kids...he somehow "does not remember" where all the apple juice caps went :-) Great post and great ideas!